A half pound of butter. 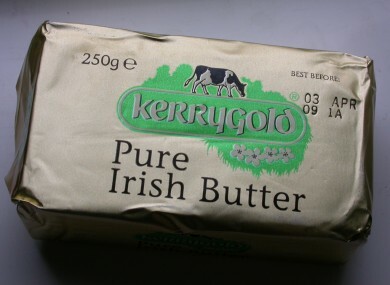 350 MILLION PACKETS of Kerrygold butter were sold around the world last year, contributing to over €2 billion in turnover for the Irish Dairy Board. The Irish food giant is the number one butter in Germany and the number one imported butter in the United States according to IDB’s full year report. In total, the Irish dairy co-operative reported sales of €2.1 billion last year and a pre-tax profit of 22.8 million. Both figures represent an increase on the previous year, 5 per cent and 87 per cent respectively. The IDB says that the created new sales and marketing teams in Russia, China, Saudi Arabia and South Africa last year and are targeting increases in those emerging markets as well as in the EU as restrictions ease over the coming years. The IDB have also announced that they are to open a new €30 million facility in Mitchelstown, Co. Cork, leading to the creation of 50 new jobs. The new factory is to be built in conjunction with Kerrygold and will also be used as an innovation centre for the multinational. The co-op has also pointed towards a number of other changes from last year they feel have strengthened their global position. These include a partnership with First Milk in the UK and the acquisition of a Saudi Arabian company as part of plans to build a cheese manufacturing facility there. Email “Guess how many of these were sold around the world last year?”. Feedback on “Guess how many of these were sold around the world last year?”.